Q: How much do your sessions cost? A: £32 for an hour. Two hour sessions are the most popular but it depends on budget and project. Why not arrange to pop in for a FREE no obligation chat through your requirements! Q: How do you like to be paid? A: By internet payment, cash or cheque. Q: How is the final recording supplied to me? A: As an mp3 or wave file via email or onto your pendrive. I can upload your track/s onto soundcloud so you can share them on facebook and/or embed into a website page. The tracks can also be supplied onto a CD. There is no charge for any of these delivery services in addition to the time it takes. Q: Should I be nervous about recording with you? A: I would most definitely say no to that one. I like to put people I record at ease with a relaxed and friendly atmosphere. Although I aim to get the best quality from each session, I’m also very patient with any challenging takes. I am always available for a chat on the phone to discuss problems or concerns. Q: Do I need a backing track? A: Not necessarily. The recording might work nicely as a solo! 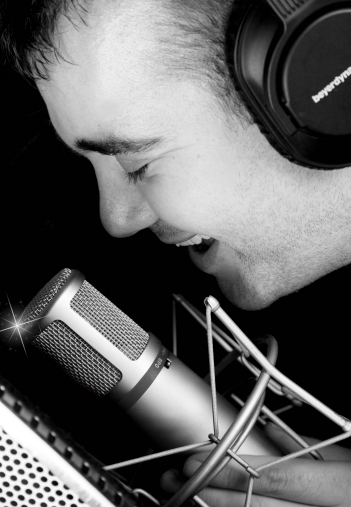 Often however people do require a backing track that I can arrange from scratch or I can obtain a quality pre-recorded backing track which cuts down recording time and costs. Ideally if a pre-recorded backing track is to be used, I like to deliver this to the client before the session so that they can practice so as to obtain a better final result. Q: Can I drop my child off for their recording session? A: No! I insist that all minors under the age of sixteen are to be accompanied by an adult for the protection of the child and the protection of my reputation. Q: Can I bring others to the session? A: Visitors are most welcome as long as they are not disruptive. Q: I can't find the answer to my question. Help! A: No problem. Just pick a contact method from the CONTACT tab and fire away . . .